This indemnity is designed to protect industrial landlords leasing premises to industrial tenants that may leave hazardous materials or other contamination on the property during the term of the lease. 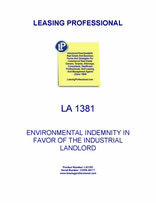 THIS ENVIRONMENTAL INDEMNITY ("Indemnity") is entered into as of ______________, by _________________ (the "Indemnitor" or the "Tenant") for the benefit of _____________________ and its successors and assigns, and the respective directors, officers, agents, attorneys, and employees of each of the foregoing (collectively "Landlord"). A. Landlord has agreed to execute a lease with Tenant of even date herewith (the "Lease") for certain real property, which is described in Exhibit A attached hereto and incorporated herein by reference. Such real property together with any improvements constructed thereon is referred to herein as the "Property." B. As a result of the Lease, or the exercise of Landlord's rights and remedies under the Lease or otherwise, Landlord may hereafter incur or suffer certain liabilities, costs, and expenses in connection with the Property relating to Hazardous Substances (defined in Section 1(c) below) which were located on the Property during the Tenant's possession and occupancy thereof pursuant to the Lease. Landlord has therefore made it a condition of entering into the Lease that this Indemnity be executed and delivered by Indemnitor in order to protect Landlord from any such liabilities, costs and expenses and all Environmental Losses (defined in Section 1(f) below). Landlord would not enter into the Lease without Tenant's execution of this Indemnity. (a) "CERCLA" means the Comprehensive Environmental Response, Compensation, and Liability Act of 1980 (42 U.S.C. 9601 et seq. ), as heretofore or hereafter amended from time to time. (b) "Environmental Laws" means any and all present and future federal, state and local laws (whether under common law, statute, rule, regulation or otherwise), permits, and other requirements of governmental authorities relating to the environment or to any Hazardous Substance or Hazardous Substance Activity, including, without limitation, CERCLA and the applicable provisions of the law of the state in which the Property is located. (c) "Hazardous Substance" or "Hazardous Substances" means (i) any chemical compound, material, mixture or substance that is now or hereafter defined or listed in, or otherwise classified pursuant to, any Environmental Laws as a "hazardous substance," "hazardous material," "hazardous waste," "extremely hazardous waste," "infectious waste," "toxic substance," "toxic pollutant," "radioactive" or any other formulation intended to define, list, or classify substances by reason of deleterious properties, such as ignitability, radioactivity, corrosivity, reactivity, carcinogenicity, toxicity, reproductive toxicity, or "EP toxicity"; (ii) asbestos; and (iii) any petroleum, natural gas, natural gas liquids, liquefied natural gas, or synthetic gas usable for fuel (or mixtures of natural gas and such synthetic gas). (d) "Hazardous Substance Activity" means any actual, proposed or threatened use, storage, holding, existence, release, emission, discharge, generation, processing, abatement, removal, disposition, handling or transportation of any Hazardous Substance from, under, into or on the Property or surrounding property. (e) "Losses" means any and all losses, liabilities, damages, demands, claims, actions, judgments, causes of action, assessments, penalties, costs and expenses (including, without limitation, clean-up costs, the reasonable fees and disbursements of outside legal counsel, engineering consultants and accountants and the reasonable charges of in-house legal counsel and accountants), and all foreseeable and unforeseeable consequential damages. (f) "Environmental Losses" means Losses suffered or incurred by Landlord arising out of or as a result of: (i) the occurrence, at any time of any Hazardous Substance Activity; (ii) any violation, at any time, of any applicable Environmental Laws relating to the Property or to the ownership, use, occupancy or operation thereof; (iii) any investigation, inquiry, order, hearing, action, or other proceeding by or before any governmental agency in connection with any Hazardous Substance Activity, or (iv) any claim, demand or cause of action, or any action or other proceeding, whether meritorious or not, brought or asserted against Landlord which directly or indirectly relates to, arises from or is based on any of the matters described in clauses (i), (ii), or (iii), or any allegation of any such matters.